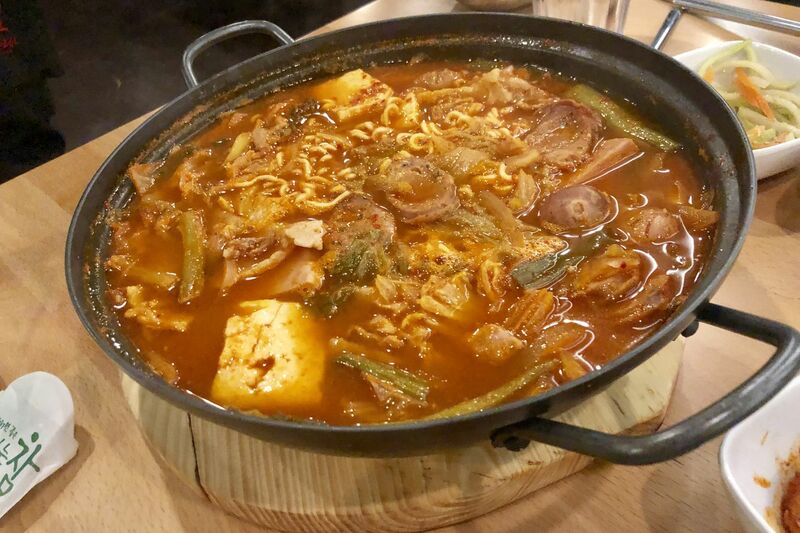 The budae jjigae "Army Stew" at Seorabol is a legacy dish from the Korean war that combines American army rations, including Spam, sausages and baked beans, into spicy Korean noodle soup. Unlike the North Philly original (one of the city’s best destinations for Korean barbecued meats), Cho’s two-month-old downtown location unfortunately does not have tabletop grills. The galbi short ribs are tasty enough, but they’re seared with less drama in the kitchen. That inevitably shifts the menu focus more toward Cho’s takes on other traditional dishes: bubbling red tofu soondubu stews; rice-crisping hot-stone bowls of dolsot bibimbap; Jjajangmyun noodles in inky black bean sauce; the pristinely minimalist but restorative broth of the short rib stew known as galbi tang. Among the most distinctive and fiery dishes here, though, is Cho’s take on budae jjigae, a hot pot for sharing otherwise known as “Army Stew,” a legacy dish from the Korean War, when impoverished Koreans blended American Army rations — Spam, hot dogs, baked beans — into the classic spicy stew known as kimchi jjigae.